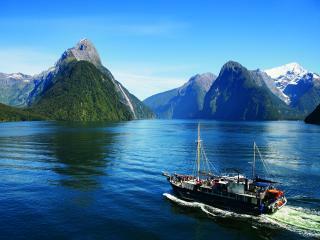 Enjoy an unforgettable experience on the Doubtful Sound Wilderness Cruise, departing from Queenstown, Te Anau or Manapouri, this full day New Zealand tour operated by Real Journeys is ideal for all travellers. Travel across Lake Manapouri, through the Wilmot Pass and onto Doubtful Sound where you will spend three hours on the water viewing wildlife, waterfalls and more. 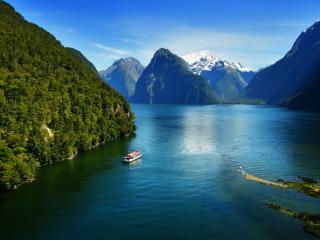 This overnight tour to Milford Sound ensures more time on this natural wonderland than any other tour in New Zealand. Boarding Milford Mariner in the afternoon, you will cruise Milford Sound with sightseeing and tender craft and kayaking options. After breakfast the next morning, there is more sightseeing around Milford Sound before berthing and boarding the bus back to Queenstown. A fabulous 2 days in the most spectacular area of the South Island in New Zealand. 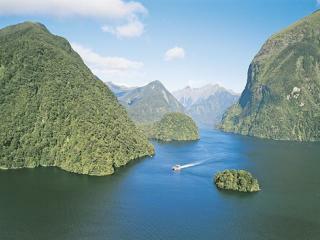 Rain, hail or shine - the Milford Sound is one of spectacular beauty. This South Island tour will take you on an incredible journey through the Fiordland National Park on a luxury coach, followed by a cruise on the picturesque Milford Sound. You will see luxuriant rainforest cling to sheer rock walls and waterfalls tumbling hundreds of metres to the sea below. 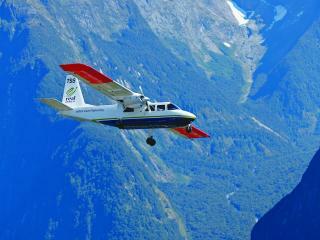 Hanging valleys, hidden alpine lakes and cloud-piercing summits are some of the amazing sights you will see when you fly over the Southern Alps between Queenstown and Milford on this unforgettable day tour. Once your feet are back on dry ground, you will spend 1 hour and 40 minutes marvelling at the tranquillity of the Milford Sound as you cruise the full length on board one of Real Journey's comfortable vessels. 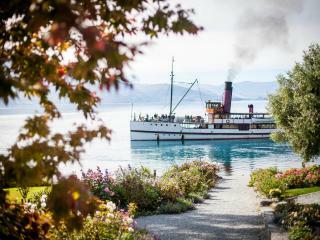 Relive the elegance of turn-of-the-century travel with a cruise on board the vintage steamship TSS Earnslaw, the only coal fired passenger carrying vessel still operating in the southern hemisphere. TSS Earnslaw cruises Lake Wakatipu to Walter Peak High Country Farm. This is a wonderful cruise and an excellent way to enjoy the spectacular views of Cecil and Walter Peaks and the western shores of Lake Wakatipu on the South Island of New Zealand. Whale Watch Kaikoura is New Zealand's only marine-based whale watching company offering visitors an exciting up-close encounter with the Giant Sperm Whale at all times of the year. 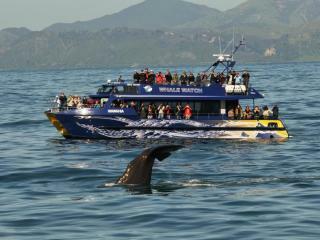 Come and experience the magic of Kaikoura with its lush pastures and towering, snow covered peaks that fall to the sea. This rare magic continues just offshore where a deep undersea canyon combines with unusual sea currents to attract an extraordinary abundance of marine life, the most famous being the Sperm Whale.